In the decades since then, Social Security has developed into one of the most popular federal programs, though that popularity is tempered by concern over its long-term financial outlook. In a 2014 Pew Research Center survey, for instance, 50% of Gen Xers and 51% of Millennials said they believed they would receive no Social Security benefits at all by the time they’re ready to retire. Earlier this year, 66% of Americans said taking steps to make Social Security financially sound should be a top priority for President Obama and Congress this year, placing it fifth among 23 issues asked about. But any reform plan entailing cuts to benefits likely would face an uphill battle for public support. 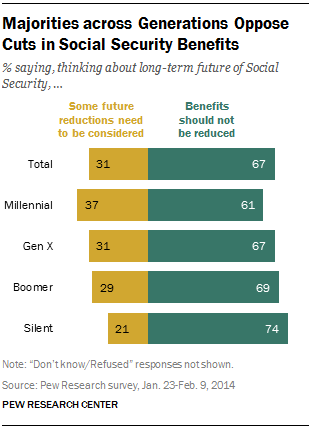 The 2014 Pew Research survey also found large majorities across all generations agreeing that Social Security benefits shouldn’t be reduced; even among Millennials, the generation furthest from retirement, only 37% said future benefit reductions should be considered. 1Social Security touches more people than just about any other federal program. At the end of 2014, according to the most recent trustees’ report, some 59 million Americans were receiving retirement, disability or survivors’ benefits from the system; the total cost was $848.5 billion. 166 million people paid payroll taxes into the system. 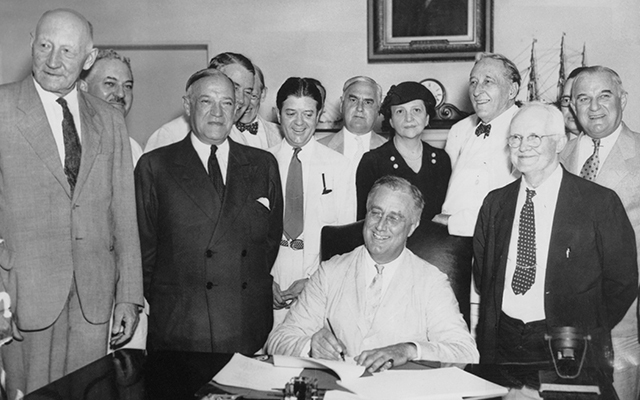 2Social Security is, and always has been, an inter-generational transfer of wealth. The taxes paid by today’s workers and their employers don’t go into dedicated individual accounts (although 32% of Americans think they do, according to the 2014 Pew Research survey). Nor do Social Security checks represent a return on invested capital, though you might be forgiven for thinking so since the “personalized Social Security statements” that used to be mailed out once a year and now are available online detail your payment history and projected monthly benefits. Rather, the benefits received by today’s retirees are funded by the taxes paid by today’s workers; when those workers retire, their benefits will be paid for by the next generation of workers’ taxes (caveat: see Point 3). Your benefit amount is based on your earnings history and age at retirement, not on how much you and your employer paid in Social Security taxes (although for most people, taxes paid are closely tied to their earnings). 4But since 2010, Social Security’s cash expenses have exceeded its cash receipts. Negative cash flow last year was about $74 billion, according to the latest trustees’ report, and this year the gap is projected to be around $84 billion. While the credited interest on all those Treasuries is still more than enough to cover the shortfall, that will only be true until 2020. After that, Social Security will begin redeeming its hoard of Treasuries for cash to continue paying benefits – as was the plan all along. 5Social Security’s combined reserves likely will be fully depleted by 2034, according to the trustees’ intermediate forecast. The disability-insurance trust fund could run dry as soon as the end of 2016, while the old-age and survivors’ fund is expected to be depleted in 2035 – assuming it’s not tapped to backfill the disability fund. (The Congressional Budget Office, in a separate report that uses somewhat different demographic assumptions, projects that the disability fund will be exhausted in fiscal 2017 and the old-age and survivors’ fund in calendar 2031; if the funds are combined, they would be exhausted in calendar 2029.) The exact depletion dates depend, of course, on future demographic and economic trends. 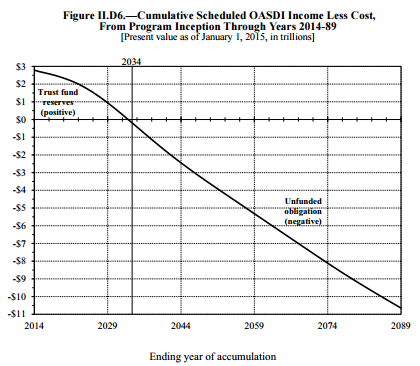 After the reserves are exhausted, the system still will be receiving tax revenue, but it will only be enough to pay about three-quarters of scheduled benefits – unless Congress changes the benefit formulas, raises the payroll tax, or makes other changes such as raising the cap on taxable wage income (currently $118,500). Note: This is an update of an earlier post originally published on Oct. 16, 2013.